Size is 47mm diameter with black metal band. Digital day, date and time very large and easy to set and read. Two weeks in and accurate with all timing and date functions. Only negative: on website face of watch appears to be blue but mine is green. No big deal but worth mentioning. Beautiful & draws attention wherever you go ! One of the most beautiful watches I've ever owned, easy on the eyes! Attracts attention wherever you go, & is easy to use & at a very, very good price from Stauer !! Buy one, You'll like it !! Overall the watch works great and is easy to set. Be aware it is a little heavy due to the all metal construction. Regarding the picture showing the watch face as blue; the color will depend on what angle the light strikes it. It will change from teal green to blue. Nice feature for the look and feel. Keeps excellent time and looks great. One of the best watches Stauer has offered. I was looking for an easy-to-read dial/face that also was unique. I liked the features on this watch too. I have had it f/~6 months & am very pleased w\it in every way, .. except one. The alarm is way too soft; very hard to hear it, even in a quiet room. I recommend it and would buy it again. Or, model #2, with a louder alarm! Stronger than a suit of armor, more precision than a laser beam, able to withstand depths up to 30 meters... it's Stauer Metropolis! The world could use a super watch. And, here it is. The Metropolis is our latest hybrid chronograph, and it’s ready to save the day with both digital and analog timekeeping. It’s ready to save you money too, defeating overpriced watches both in looks and in performance. 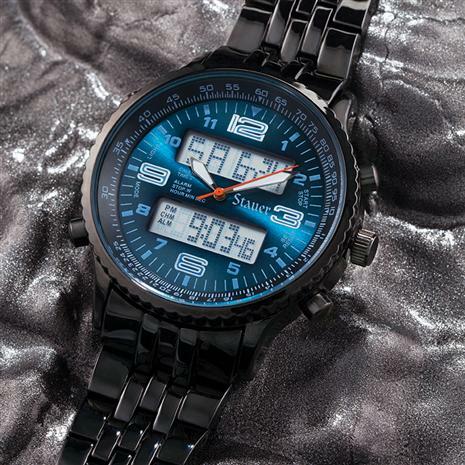 A steel watch is grounded in practical confidence. It has no exotic pretenses. Finding a steel watch with a matching steel bracelet is fairly common. But finding a steel watch that’s just as tough under the hood has proven elusive to even prominent watch manufacturers…until now. The Metropolis merges the durability of steel with the precision of crystal movement that’s accurate to 0.2 seconds a day. The Metropolis doesn’t skimp on features either, and comes equipped with a stopwatch, calendar, and alarm, and is water resistant up to 30 meters. So-so watches masquerading as luxury timepieces are an injustice. We don’t have the time or patience to deal with decoys. What we do have is the experience and know-how to make extraordinary timepieces amazingly affordable. The Stauer Metropolis may not make you leap tall buildings, but it will make you feel pretty darn super. FITS WRIST SIZES 7" - 9"